November 11, Armistice Day, was long since turned into a "patriotic" show of faux concern for veterans of the U.S.'s many, many wars. Children and teenagers have known nothing else, and they get the message loud and clear that "patriotism" is mandatory or else. I want to share this moving poem by Veterans for Peace co-founder Doug Rawlings here. I have been pasting it in as the perfect comment on social media rah-rah "patriotism" around Armistice Day. gather at high noon. There are no shadows. The burnt children just keep piling up while the U.S. taxpayer funding it all looks to the flag and pretends not to see what wars are doing to our soul. 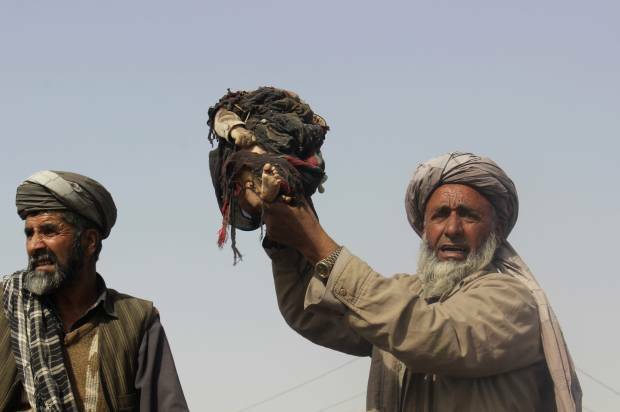 from Salon: An Afghan man holds up the body of a child that was killed during clashes between Taliban and Afghan security forces in Kunduz province north of Kabul, Afghanistan, Thursday, Nov. 3, 2016. Authorities say a joint raid by U.S. and Afghan forces targeting senior Taliban commanders killed two American service members and 26 civilians. Afghan officials said they were still investigating the attack and its civilian casualties, some of which may have been caused by the airstrikes. Afghanistan is the war the corporate party candidates ignored. But those whose babies are burnt by it are well aware of what 13+ years of U.S. military presence has done there. Napalm burns did not kill Kim, although they were expected to. She grew up and became a goodwill ambassador for UNESCO. In 1996 she had the opportunity to meet the pilot who coordinated the bombing of her village; she forgave him. Here she is with her family. Kim Phúc survived her trauma but many of the U.S. soldiers who came home with moral injuries from their participation in the war in Vietnam went on to suffer from drug addiction, homelessness and suicide. Many veterans have reported feeling especially horrible when people call them heroes. Even if they were drafted as teenagers, their guilt is overwhelming, and they often have not survived it. The only winners in war are the profiteers who make money from it. Why do you think corporate media outlets work so hard to make every child in the U.S. "thank" veterans? The saddest thing is it's likely no one will ever teach them that November 11 was originally celebrated because it marked the end of a horrific war that devastated millions. 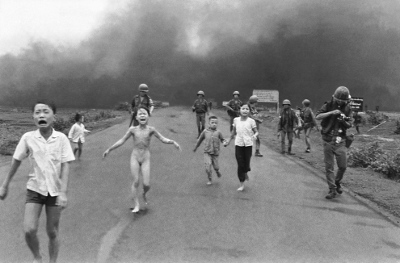 The war in Vietnam is now undergoing a similar revision of history as the baby boomers who lived its truth die off. Veterans for Peace has created Full Disclosure as a resource for those interested in knowing the truth. 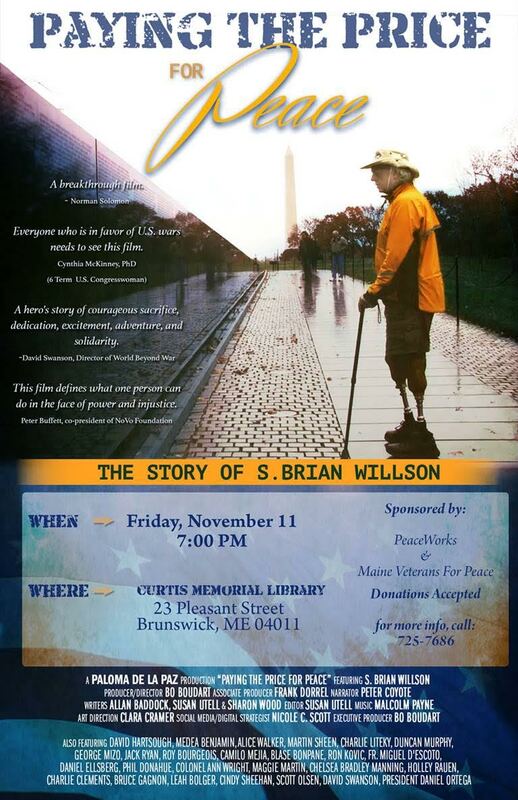 And, if you happen to be in Maine today, you have the opportunity to hear the story of a VFP member, Vietnam vet S. Brian Wilson, and his heroic work for peace in the decades since he lost both legs.